Systems Solution for Branch Banking is targeted to the financial institutions that have chosen to keep a decentralized infrastructure. This is approximately 50% of the customer base. This solution is a technology sell, and will therefore be most attractive to banks that are due for a technology refresh (that is, those that have not done a major upgrade of their branch infrastructure for the past 5 to 10 years). 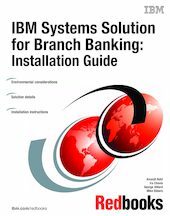 This IBM Redbooks publication discusses how to install and configure the components of the Systems Solution for Branch Banking, a hardware and software solution that enables banks to provide a common, easy-to-support IT infrastructure in their branch locations. The solution takes into consideration that the skills required to upgrade or maintain the infrastructure in the branch do not exist, so we provide a remote management function. Although a common solution has been defined, each implementation may have its own unique variations, depending on the network, software, and hardware environments.